Anthony Joshua will fight against Jarrell Miller in Madison Square Garden in New York City on Saturday the 1st of June. Here Anthony Joshua defends his status as undisputed heavyweight champions of the world. Miller has been boxing for many years, but recently his name was mentioned with the top stars in the heavyweight division. 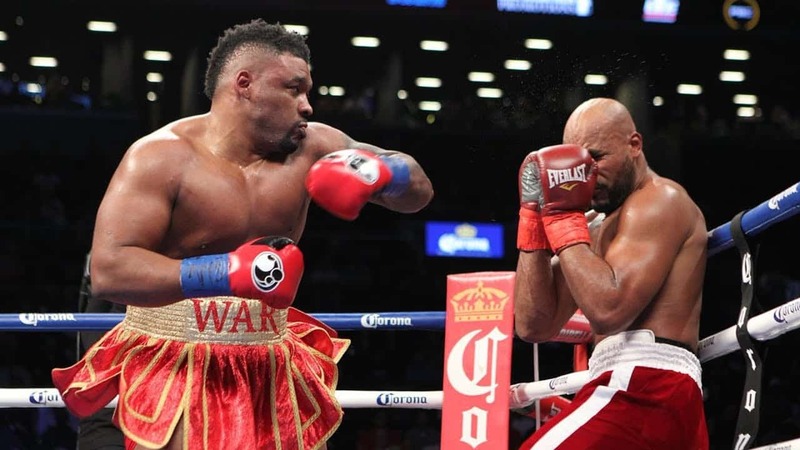 But who is Jarrell Miller? Read everything you need to know about Joshua’s opponent here. If you are looking to wager some money it is best to research the competitors for the best betting odds. Miller was born and raised in Brooklyn, New York, and he very much identifies with the New York culture. He started doing Muay Thai when he was 14 because he wanted to defend himself after being attacked on the street. He began boxing at the age of 16. Miller was born on 15 July 1988 which makes him 30 years old now. He’s still young by heavyweight standards. Many heavyweights compete at a high level into their 40s. During his early pro boxing career, he created a nickname for himself. In the early days, Miller would arrive into the ring in a nappy, bib and pacifier. Because of this, his nickname is “Big Baby”. This nickname does make sense since he’s 6’4’’ and has weighed more than 300 pounds in each of his last three fights. Furthermore, he is currently ranked the world’s sixth-best active heavyweight by Boxrec, and ninth by The Ring magazine. Miller has a past in kickboxing. He was a professional kickboxer at the highest level. He compiled 22-2 records with 10 KO. Miller fought in K-1 and Glory before putting down the sport. Miller did kickboxing till 2014, so he was 8 years active. He switched to boxing because Miller thought more money could be made in the boxing scene. In 2014 he was suspended for nine months by the California State Athletic Commission (CSAC) after methylhexanamine was found in a urine sample he gave for Glory 17: Los Angeles. During his professional boxing career, he competed in 24 bouts. Miller has compiled a record of 23-0-1 with 20 KOs. The lone draw came very early in his career, back in 2013, in his fifth pro fight against Joey Dawejko. Miller would have won a decision, but he had two points deducted for pushing. Moreover, Miller is promoted by Dmitriy Salita. He’s a former boxer who also promotes women's pound-for-pound champion, Claressa Shields. This fight will be the biggest get for Salita since he has been promoting for only a short period of time. Also, Miller is signed with DAZN and Joshua is promoted by Matchroom, which is also linked to the streaming service. Therefore, there shouldn’t be an issue when determining distribution. If we have a look at his best professional victory we don’t find any big names. Since Miller hasn’t been boxing for that long he didn’t compete against a huge name yet. He does have impressive wins over respected heavyweights like Johann Duhaupas and Gerald Washington. Furthermore, let’s have a look at the skill set and potential weaknesses of Miller. Despite his size, one of Miller's best attributes is his movement. He throws punches from more angles than you usually see from contenders in the division. He’s shifty, but still bullish and unafraid to use his size to his advantage. Miller’s athleticism and strength on the inside could be his biggest advantage. Although Miller is quick and agile, his marginal conditioning might turn his back against him. It would be more ideal if he lost some weight. Also, Miller’s defence can be a little suspect at times. Against Duhaupas he was touched a lot, especially with the jab. Miller is one of the best talkers in boxing, his charisma, and personality on the mic is undeniable. He’s been provoking the fight with Joshua for over a year. He labelled Joshua as a fake and a cheap champion who is afraid to fight the best. He revealed he has a personal dislike for Joshua: “I don’t like AJ, I just don’t like him, I don’t like what he stands for – he puts this humble c**p on, but behind closed doors, he’s just a p***k.” Miller continues: “He’s super duper fake, there’s a lot of things about AJ that’s going to come to light – but when we sign the contract I’m going to poke fun at him, bully him and speak, that’s who I am. Certain people are afraid to step outside the box, he’s afraid to step out of London and afraid to fight guys.” Miller firmly believes Joshua is full of fear and he’s afraid to fight good boxers. Who do you think will win the fight? Is Miller right and is Joshua afraid to fight or will Joshua defeat Miller? It’s already a very interesting fight so far.